1. Include them in the care of the baby. Let them help you bathe the baby, feed the baby, and dress the baby. The more involved they are in the care of the baby, the easier it is for them to understand and accept the baby's presence in their life. 2. Still spend one on one time without the baby there. Your child will adjust far better if you still help them feel important and not always second to baby. So get a sitter, or trade off with your spouse and spend some one-on-one time with the older sibling without baby there, to help them see you still love and care for them. 3. Talk to them about the baby and the changes there will be, so it is not a shock. If you want your child to adjust well, you have to prepare them for it, so spend a lot of time before the baby comes talking about the baby, and how things will be different when the baby arrives. This gives your other child or children a chance to adjust to the idea. 4. Have them get to know the baby. Babies can seem like nothing more than crying, stinky lumps to other kids, so help them see that the baby has a personality. Help them get the baby to laugh, smile, etc. Help them interact with the baby so that they get to know its unique personality traits. 5. Get stuff for the other kids too. If you have a baby shower, or buy things for the baby, your other child may be resentful of all of the attention and stuff the baby gets. Help them adjust and accept the baby better by having a few things for them as well. If you have a shower, include a few gifts that they get to open and that are for them. 6. Read books or watch shows about babies! There are a lot of books and even kid shows out there that introduce the idea of new babies and a new sibling to kids in a fun, entertaining way. So, buy some books, and read to your child about other kids who have had a new baby come into their home. 7. Involve kids in making plans for baby. As you prepare for the baby, and their birth, and their life at home after, do not exclude your other children. Let them help you plan the room for baby, the plans for when you go to the hospital, such as who they will stay with, even let them pack themselves. The more involved they are, the more excited they will be. 8. Let them get something for baby! Babies require several items and so chances are you will be visiting a store and purchasing things for baby. So, let your other child or children pick a gift for baby. This will help them feel like they have a special bond, and will help them be more excited for life with baby. 9. Let them touch the baby, don't be too weird about it. 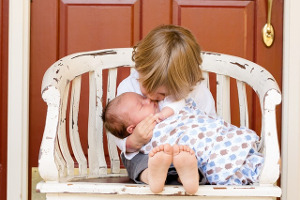 While germs are a risk factor for babies, if you want your older siblings to adjust to life with baby, you can't make them feel like they are excluded from baby. So, allow them to touch the baby, sing to it, kiss it, etc. The baby may not like it, but it goes a long way in helping the other child feel good about having a new person to compete with for attention. 10. Make it a non-issue. Do your best to keep life for your other children as normal as possible. If too many things in their life change, the adjustment will be far harder. So, if you know they will have to go to bed earlier once baby comes, or if dad will have to get them ready for bed, or whatever the case may be, start it before baby comes so that it is not such a shock, or so related to baby in their minds. Visit https://www.surfnetparents.com for more For more parenting advice and ideas.